Public policies to cap population in China’s two largest municipalities are yielding results. 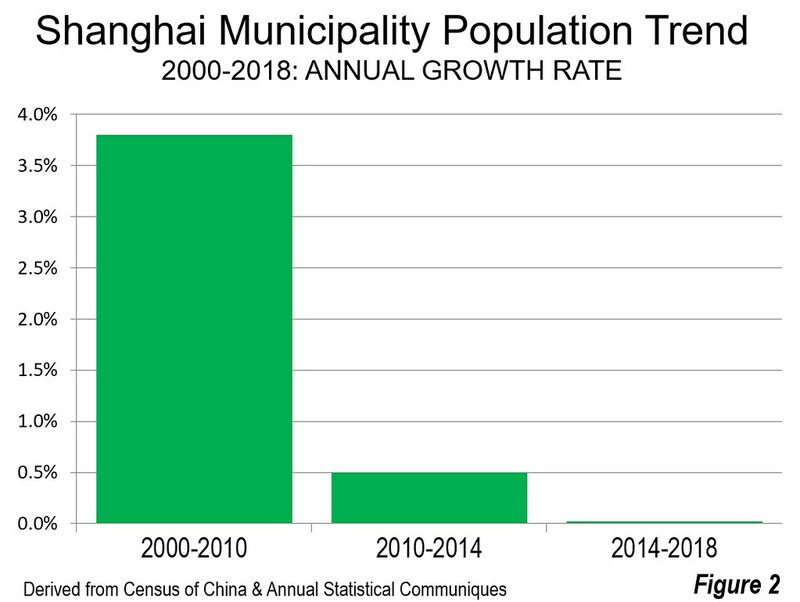 The latest annual statistical communiqués indicate that Shanghai and Beijing are now at population levels below the all-time peaks reached earlier in this decade, as population growth is being steered to peripheral areas in exurban and rural areas. This article describes population trends through the end of 2018. Beijing’s objective of limiting the provincial level municipality’s population showed particular success in 2018. According to the Statistical Communiqué of the National Economic and Social Development of Beijing in 2018, the population of the nation’s second largest municipality dropped 165,000 in 2018, to 21,542,000 from the end of 2017. This loss places Beijing’s population at only slightly above its 2014 level of 21,515,000. Between the 2010 census and 2014, Beijing had grown at an annual rate of 2.3 percent, adding 1.9 million new residents. From 2014 to 2018, the annual growth rate has been 0.3 percent, only 1/8th that of the previous four years. Beijing’s population peaked at 21.73 million residents in 2016. The contrast with the previous decade is even greater. Between the 2000 and 2010 censuses, the annual growth rate had been 3.8 percent, as the municipality added more than six million residents (Figure 1). Even so, Beijing’s population remains eight million above the count from the 2000 census. The population limitation objective is a part of the overall strategy to disperse the population, manufacturing and administrative functions that are concentrated in Beijing to adjacent areas in Tianjin (also a provincial level municipality) and the province of Hebei (See: “The Evolving Urban Form: Jing-Jin-Ji: Dispersing Beijing”). It is expected that population growth will be in the areas of Jing-Jin-Ji outside Beijing. Shanghai, China’s second largest municipality, has also limited its population growth in the second half of this decade. According to the “Statistical Communiqué of Shanghai National Economic and Social Development in 2018,” Shanghai had 24,237,800 residents at the end of 2018. This was an increase of nearly 35,000 from the 24,183,000 estimated at the end of 2017. However, Shanghai’s population remained below its 2014 peak of 24,256,800. Shanghai’s population trajectory has been similar to that of Beijing. Between 2000 and 2010, Shanghai’s population grew by 7.4 million, from 16.4 million to 23.8 million, for an annual growth rate of 3.8 percent. Between 2010 and 2014, the annual growth rate was much lower, at 0.5 percent, while there was a 0.02 percent annual loss from 2014 to 2018 (Figure 2). Yet, Shanghai’s population is almost eight million more than in 2000. As in Beijing, virtually all future population growth is likely to be in the periphery. Shanghai is the core of nearly contiguous urbanization that stretches from Zhoushan, Ningbo and Hangzhou in Zhejiang to Suzhou, Wuxi, Changzhou and Nanjing in Jiansu province, where population growth continues. 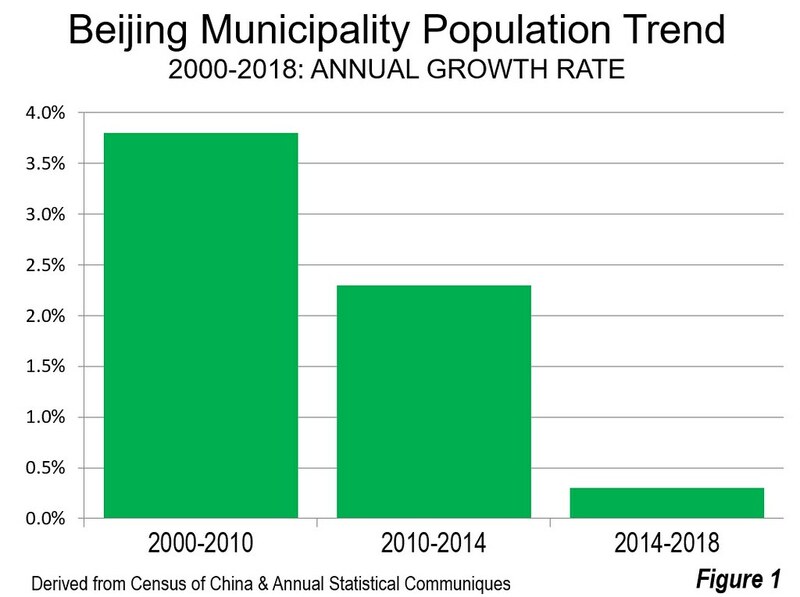 After a decade and more of “breakneck” urban growth, China’s urban areas are growing more slowly, though they generally continue to grow outside Beijing and Shanghai (See: “China’s Shifting Population Growth Patterns,”). At least two factors have contributed substantially to this trend: China’s low fertility rate and overall reduced population growth rate (which is expected to yield net declines in the decades ahead) and the stronger growth of commercial activities (and jobs) in the central and western provinces (See: “China’s Next Leap in Manufacturing,” see Figure 4 in article). The attempts to force decentralization and cap population in an entire urban area are unusual. Perhaps the most significant prior effort was London, following the related events of the 1940 Barlow Report, the 1947 Town and Country Planning Act and imposition of the Green Belt in the 1950s. All population growth from the 1951 to 2011 censuses was outside the London urban area, in exurban areas, beyond the Green Belt (though after 2011, London finally reached a population exceeding that of 1951). The London, Beijing and Shanghai initiatives are considerably different from more recent urban containment initiatives. In Beijing and Shanghai, as well as in the early decades of the London experience, lower urban densities have been an objective. In contrast, modern urban containment policy normally seeks higher densities, seeking to stop new residential development outside virtually inflexible urban growth boundaries (such as in Vancouver, Seattle, Portland, San Francisco, Sydney, Melbourne and elsewhere).